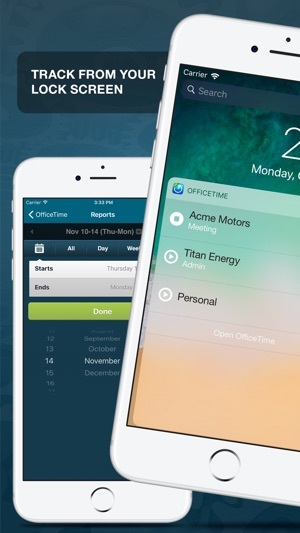 OfficeTime is an amazingly intuitive time tracker. Where other time keepers are clumsy or oversimplified, OfficeTime balances features and ease of use, allowing you to easily track exactly what you do each day. 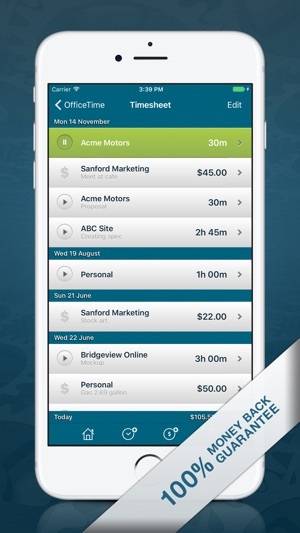 Try our other free version and upgrade to this paid version keeping all your data. 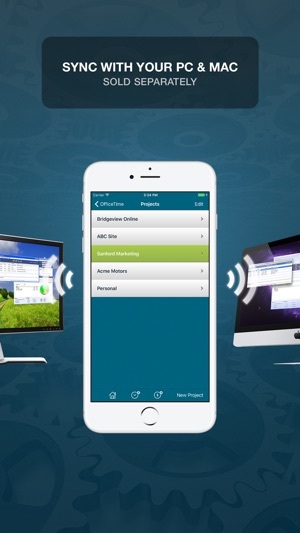 Wirelessly sync with OfficeTime for Mac or PC (sold separately) for easy invoicing and much more. * Track your time from your "today" screen with the OfficeTime widget. * Work offline. No need for WiFi or cell connection. * Export to Numbers, Excel and tab delimited. * Free Apple Watch version to start and stop tracking on the go! How does this differ from the free version? You get unlimited projects and categories, export by email, rounding, sync to Mac/PC (sold separately) and OfficeTime on your Apple Watch and home screen. Another lovely, little update with quality of life improvements to the home screen widget, reports and category picking. I can’t express how disappointed I am with this app. Once you figure out how to get it to work, it’s pretty convenient to click on and off from the time sheet window. Project setup is easy. Yes are easy to input. BUT...and here is the big BUT that had us stop using it today. 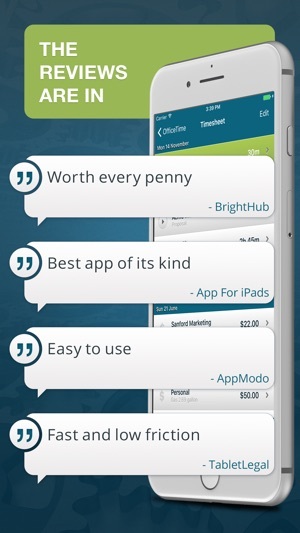 I have been diligent about using this app to do freelance billing. Today, when going back to do my two-week billing, I found two whole WEEKS of projects and time sheets completely missing! I have to go back and recreate them or not get paid. Hours and hours and hours of work. I do a lot of segmented work with different clients, often an hour here or a half-hour there, or even ten minutes for phone calls or edits. That is impossible to find again. This is the third time this has happened. Today, we downloaded Toggl. It integrates with our project management software, so this may work out. Otherwise, it’s back to pencil and paper. I’ve tried now something like nine time tracking products. All fail or aren’t flexible enough. This one, had it worked reliably, was pretty good. But, I can’t have lost time like this. Hi! OfficeTime should never lose time. That's not right at all. Write to me asap on support@officetime.net and I'll look into this and do all I can to help plus let's get you a free copy of the desktop app to backup your data. 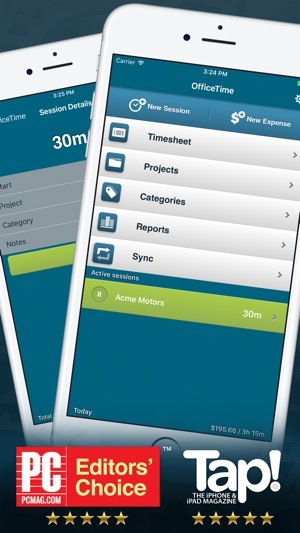 Good app for tracking work time on projects and allows for setting job cost rate to make it easier to invoice clients. Does allow multiple timers. Can export your tracked time data in various file formats including tab delimited, .csv, .txt and .xls. Can include or exclude column id field. Also offers file name prefixing when exporting if the data should need to be imported into a database program. It now includes a Today Widget to offer access to current/recent projects to quickly start and stop timers. I personally wish that the widget feature had been integrated 2 years ago, but I guess better late than never; can you say Agile, unfortunately not. Now I just need to decide if and when I'm willing to export all of my data from the app I switched too a couple of years ago. I appreciate how OfficeTime provides the features to track and report time in any manner needed and pull reports in seconds. Time can be tracked and easily synced across different devices. During the 10 years or so I have used OfficeTime it has crashed so infrequently that if it does it is notable because it is such a rarity. I have never lost data. And newer versions add new features without sacrificing robustness. I can’t comment on their documentation or service because OfficeTime has such easy to use features and is so robust that I’ve never had to look at the app’s Help menu or contact the developer. © 2018 Productive Monkey Ltd.